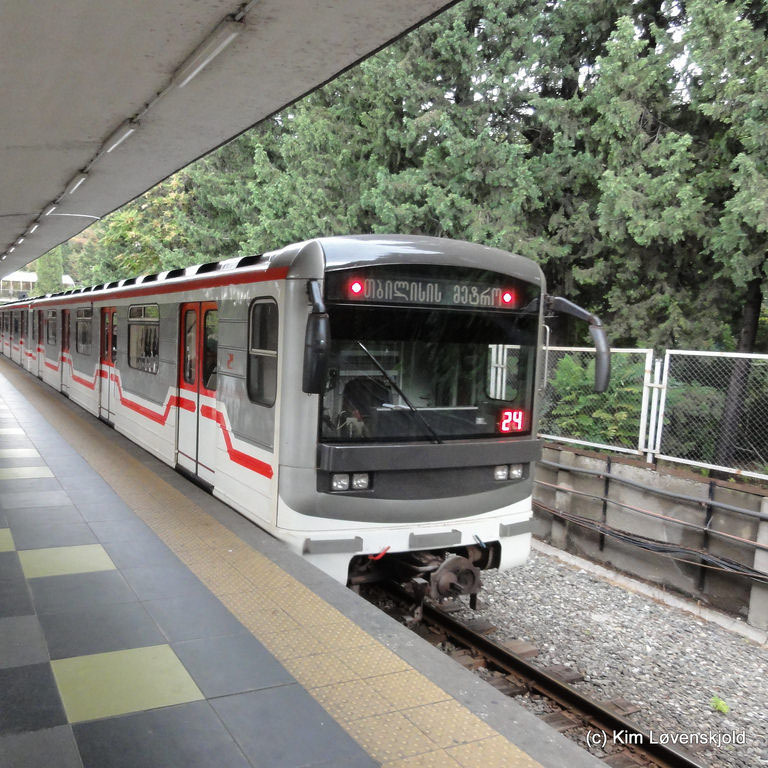 Tbilisi has a two-line metro system, which operates 06:00-23:59. All signs inside the metro are in Georgian and English. Station names are announced in both English and Georgian as well. There are a few system maps in carriages, usually located above one of the carriage doors. 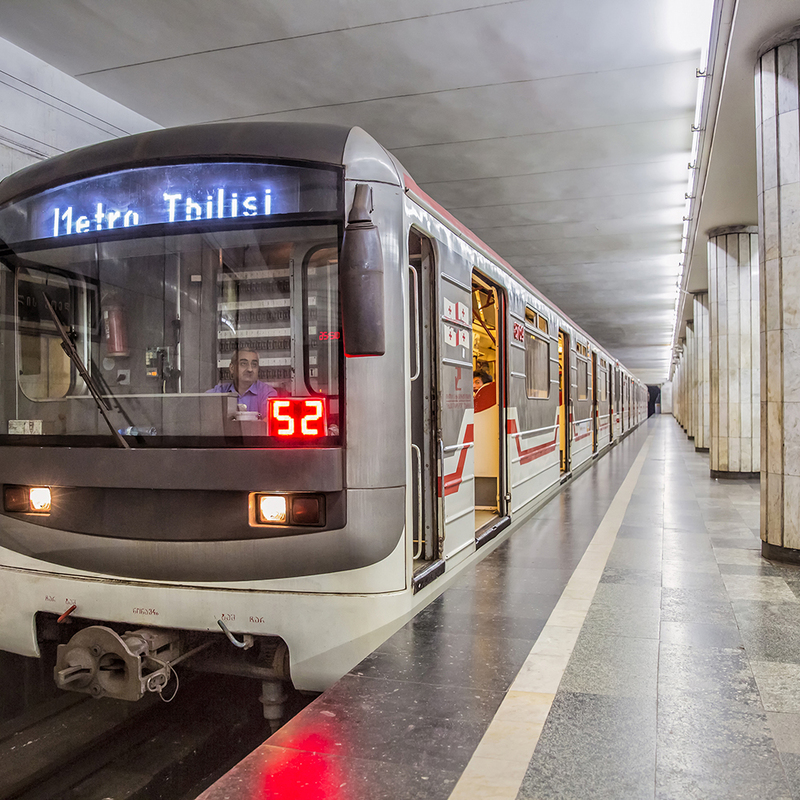 It will be hard to find English speakers riding the Metro; Russian, however, is widely spoken. Take a bilingual map with you if you are not proficient with the local alphabet/pronunciation. 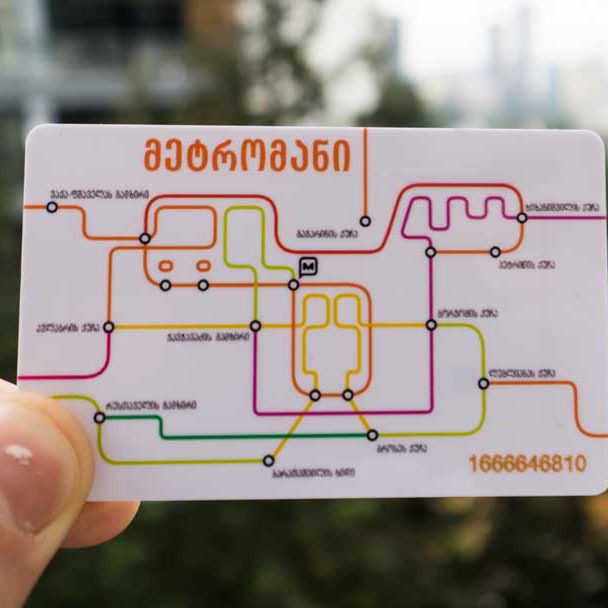 A trip with the metro and bus system in Tbilisi costs GEL0.50, but you will have to buy a Metromoney card (GEL 2) at the counter. You can load the card with any amount you like, and use it for travel on buses, microbuses, the metro, and the cars. Marshrutkas vary in price from GEL0.40-0.80. At the Samgori station, near the east end of line 1 (red), one can change for bus 37 to the airport. The bus actually goes all the way to the city centre, but roads can become congested, so changing may be a quicker option. City buses are yellow and blue, and come in various sizes. The bus number and a description of the route are usually listed on signs in the bus windows and bus stops. The city recently installed electronic arrival boards, with reasonably accurate estimated arrival times, at bus stops on major roads. The signs are in English and Georgian, and display the bus number, minutes to arrival, and destination. Board through any door you like, usually the double doors in the middle are easiest. A journey costs GEL0.50, and exact change is required if you don't have a Metromoney card (which can be purchased at metro stations). If you have a Metromoney card, touch it on the top of the card machines and make sure you wait for a paper ticket or a sign on a display (depends on device, both are provided) to be issued. Hold onto the ticket you receive on the bus (or card); you will need to present it to the blue-shirted ticket checkers upon request. Marshrutkas are vans which service the side streets of the city; they are independently owned. Like buses, the route is posted in the front window (often only in Georgian), but marshrutkas use a different route numbering system, and the route descriptions may be more general than the buses (e.g. "Vake" rather than a specific street in the Vake area). Fare is (on average) 0.80 GEL; shout "gaacheret" when you want to get off, and hand the driver your fare on the way out. In the new yellow Ford Transit vans you can pay also with the Metromoney card. Taxis in Tbilisi are typically privately owned vehicles, but Uber kind services like Taxify, Yandex Taxi and etc run on a meter. ALWAYS negotiate a price beforehand, and insist on paying before departing. A trip anywhere in the city should never cost more than 15 lari, unless you're going to the airport. Getting a receipt is also really difficult if not impossible! • Taxify - mobile application with hundreds of verified taxi drivers in Tbilisi. Choose taxi by distance, car model and user feedback ratings. App calculates taxi ride fare and local support team monitoring the rides and solving potential issues. • Yandex.taxi - mobile application that works like Uber. Probably the cheapest version. A ride within the city will set you back between 1 and 5 Lari. In 1900 the city government commissioned the Belgian engineer, Alphonse Roby, to construct a funicular. The 500 metres long line was opened in March 1905. It consisted of three stations, the lower on today’s Chonquadze street in the city, the Pantheon stop near the Mtatsminda Pantheon, and Mtatsminda, at the top of mountain. It was closed in 2000 following an accident, but reopened in 2012 after a comprehensive reconstruction project that renovated the stations and replaced the drive mechanism, rails, cars and safety equipment. A single ride is 2 Lari, but you also need to purchase a rechargeable card (valid also for Mtatsminda Park) which costs 2 Lari and is not refundable. Cars run every 10 minutes from 09:00 to 04:00. 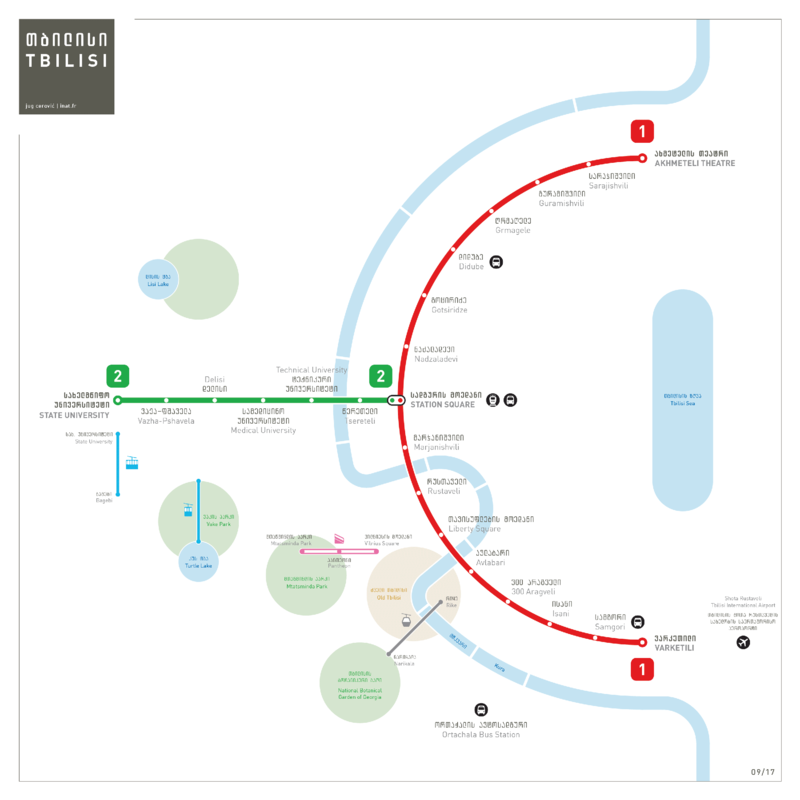 Tbilisi's most exhilarating ride – along with the Mtatsminda funicular – is the cable car, new in 2012, which swings from the south end of Rike Park high over the Mtkvari River and Old Town up to Narikala Fortress. To ride it, you need a Metromoney card, available at the ticket offices if you don't have one.